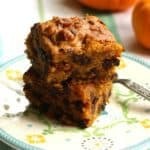 Pumpkin chocolate chip cake is a wonderfully easy fall dessert. This recipe is dairy free and egg free. Preheat oven to 350 degrees F. Line a 9×9 glass pan with parchment paper if desired. This isn’t required, but if you wanted to pull the whole cake out of the pan to place on a serving tray, it would make things a lot easier. Sift together the dry ingredients with a fork. Add the oil, vanilla, vinegar, pumpkin puree, and water. Mix together by hand, and don’t overmix. Stir in vegan chocolate chips. Pour into a 9×9 square Pyrex dish and bake at 350 degrees for 32 minutes, or until a toothpick inserted in the middle of the cake comes out clean. If you use a gluten free flour blend, reduce the amount of pumpkin by 2 Tablespoons. You can make this cake one day ahead of time. Leftovers could also be frozen - just wrap individual pieces in waxed paper and store in a freezer bag.